Lisa Kinoshita’s Bridle Show explores the vanishing art of horsehair hitching, a traditional Western art whose most skilled practitioners are amongst the inmates at Montana State Prison (MSP). 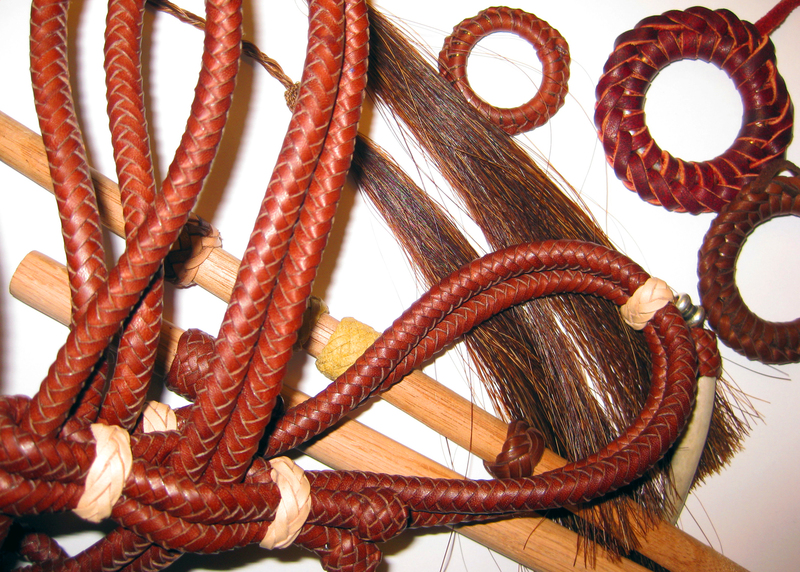 Kinoshita traveled to the prison to interview some of the inmates who are making horsehair art, and she took up the parallel art of leather braiding and knotting, a time-honored practice of vaqueros and cowboys, to collaborate on a single horse’s bridle which demonstrates the beauty of a functional art form revered in centuries past. Since the 1800s, prisoners at MSP have kept this incredibly intricate and increasingly rare art alive inside prison walls, passing on their knowledge from hand to hand (mostly) under supervised conditions. Hitching exists at other prisons, in Washington (Walla Walla), Wyoming, Colorado, and Arizona, but none surpasses the quality of work coming out of Deer Lodge, MT. Prisoners are allowed to sell their finished pieces, such as horsehair bridles, for up to thousands of dollars in the prison gift shop. In the process, they are keeping alive a skill that few modern artisans have the time or patience to master.